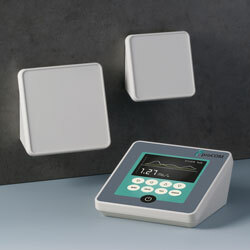 OKW has released an all new square enclosure for desktop, indoor or outdoor wall-mounted electronics. Advanced new PROTEC is intended for applications including access and security control, surveillance; IoT/IIoT; smart factory; data acquisition; building services and central control systems; Industry 4.0; gateways; measurement and control; data systems engineering; medical technology. Three versions are offered: Version I has a deep recess at the rear for connectors, switches, interfaces and cables; Version II is alike but with a snap-on cover for the recess; Version III has a deep cover that gives extra space. All three versions provide a front operating panel (inclined by 20-degrees for added ergonomic comfort) with a recess for a membrane keypad. There is an abundance of space for a touchscreen and PCBs can be fitted on three levels inside. All the fixings are concealed on the underside. They are corrosion-proof stainless steel Torx screws to discourage tampering. Rubber feet assure the enclosures do not slip through desktop use. Each version of enclosure is offered in three sizes from 140mm x 140mm x 76mm to 220mm x 243mm x 108mm. The cases are moulded from tough and UV-stable ASA+PC-FR in off-white (RAL 9002) as standard. All models can be sealed to IP65 with the optional sealing kits.